Polyesters are used for both internal and external applications with a broad spectrum of colors available. Polyesters are an economical product with reasonably good performance across the board of properties on most substrates. A sub-class of products referred to as “Highly Durable Polyesters” has emerged recently with improved formulation making for a significantly improved durability, particularly in the resistance to UV degradation. SMP paint systems are a blend of polyester and silicon intermediates. Silicon acts to improve the gloss retention and weather resistance of the polyester coating. SMPs are available in a variety of gloss levels and will retain gloss longer than polyesters. 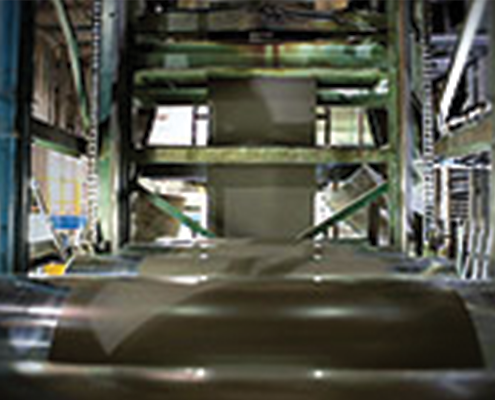 SMP formulations on building systems often provide a 20+ year warranty against chalk and fade. This is a premium finish based on the Kynar 500 resin licensed by Elf Ato-Chem North America, Inc. The resin contains 70 percent Polyvinylidene Fluoride. Polyvinyliedene Fluoride (PvDF) paint systems are designed as a premium building product used in architectural applications. They are highly resistant to UV radiation and have excellent stain resistance. PvDFs are generally more costly than other systems but they provide superior durability and color stability on exterior finishes. Metallic finishes are usually PvDF coatings that add a high tech look with a deep luster and depth of color to the metal surface. A thick film coating of polyvinylchloride that is usually applied at a film thickness ranging from 4.0 mils to 10 mils. Platisols provide a very robust coating with excellent abrasion and corrosion resistance.